Tangy Raw Cauliflower Salad is the best thing to have for lunch or even dinner on the days following a rich dinner party. 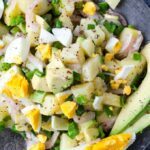 This salad gives you the feeling of refreshment you need after you are loaded with high-calorie foods. It is a very healthy salad full of vitamins and nutrition. Even the cauliflower haters will love this amazingly scrumptious salad because they won’t understand it’s cauliflower. It is a crunchy mixture of raw cauliflower, red bell pepper, mung beans and greens. I want everything inside this salad in tiny size, so I grate the cauliflower. You can’t guess it is cauliflower; it tastes just like cabbage. Especially red cabbage is typcally used in crunchy salads, but raw cauliflower is not as common in salads. Believe me there is no difference when raw, so why don’t we use this vitamin rich winter vegetable in salad? I grate the cauliflower because it is easier and quicker, but it looks even nicer when you divide or chop it in very small florets. The second important ingredient in this Tangy Raw Cauliflower Salad is mung beans. Have you ever heard of it? Please see the small green lentil like beans in the pictures. They are boiled mung beans. As you can see, these beans are much smaller than white or red beans; almost as small as green lentils. Mung beans are not very common in Turkey, so I never think twice to buy when I rarely see it at the market. As far as I know, mung beans are part of Indian and Chinese cuisines. They are pretty nutritional; rich in fiber, magnesium and vitamins B and C. It is said that these little guys are good for diabetics too. So you should have mung beans in your diet if you can find it in your area. You can make various recipes with these beans like stews, but I do love them in salads. You can use other types of beans in the salad if you can’t find mung beans. I prepared a very tangy dressing for the raw cauliflower salad flavored with dried mint. Make sure you are generous enough when using the dressing on this salad. Raw cauliflower needs a lot of dressing, which is another great thing about the salad. The dressing doesn’t contain and mayo or cream; it has just lemon, vinegar, homemade pomegranate molasses, salt and dried mint. 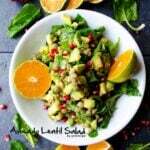 A festive detox salad with cauliflower, mung beans and greens. This raw cauliflower salad is definitely a perfect dish for the summer weather here in Australia at the moment – I have to make it!